American blues singer & harmonica player at the emergence of 'electric blues'. Famous compositions include "Checkin' Up on My Baby", "Help Me", "Eyesight To The Blind", "Don't Start Me Talkin'". 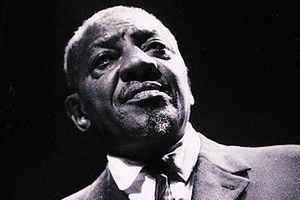 Not to be confused with the earlier & more 'acoustic' Sonny Boy Williamson (of "Good Morning, School Girl" fame). Subsequent research has shown that Miller was born Aleck Ford on the Sara Jones Plantation in Tallahatchie County, Mississippi. He took on the name of his sharecropper stepfather, Jim Miller. His gravestone lists his date of birth as March 11, 1908. The stone erected by his sisters in Tutwiler, MS, lists his death as 23 June 1965. Such is the mystery of blues legends. For the songlist, please use the link below.